YP! is Hiring, Hosting Upcoming Events, Webinars, and more! Youth Peer Advocate Leaders Meeting Dates Announced! Support Youth/ Young Adult Development through Social Media! 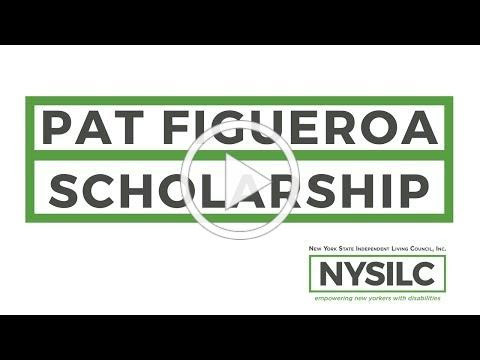 "Pat" Figueroa Scholarship Applications are open! Develop your brand as a rising entrepreneur! LOCATION: Must reside in one of the 16 counties in the region. Preferred location Albany. of October! These training's are designed for youth (14+) with developmental/intellectual disabilities, but all are welcome to attend. Graduates of the New York Institute for Self-Advocacy (NYISA) will be presenting on topics such as disability history, strategic sharing, personal leadership planning, and more! Attendees will learn these invaluable self-advocacy skills from fellow youth and peers! The dates, times, and locations for each training are as follows. October 26th at the Hillside Children's Center (1 Mustard Street, Rochester NY, 14609, Room 143) from 5:00-8:00 P.M.
October 16th at the Crandall Public Library (251 Glen St, Glens Falls, NY 12801) from 5:30-8:30 P.M.
Click here to download the registration form OR contact Zach Kilmer to register today! This meeting takes place virtually. After registering, you will receive a link via email to connect using your computer or smartphone. This event is intended for Youth Peer Advocate Supervisors in the Western Region of NY. >> Share ideas, resources, and upcoming opportunities! >> Discuss strategies for implementing youth peer services, including the challenges and successes involved! >> . . . and MORE! Join Youth Peer Advocates from around New York State to develop skills, share information and become educated on issues related to youth peer advocacy and more! October's topic is overcoming stigma and barriers to young people in the workplace! Did you miss our first Statewide Peer Leadership Support and Development ( PLSD ) Meeting? Check out the link to the recorded webinar here ! youth who are involved in systems! Learn the importance of engaging youth who identify, how to work with LGBTQ+ youth in various systems and settings, and how you can better ad the community and promote resiliency. Don't forget to register HERE now! If you have questions, please reach out to either Mica Gonzalez or Zach Kilmer. Calling for Youth Council Members! consider being a council member to work on the policies and procedures that oversee the further development of the website and the rules that govern the users. Erie County approved and funded a website proposal based on youth/young adult focus groups which stated what they need to be successful from transitioning in and out of school and onto employment. WNYIL would like to keep it in the hands of the users and target audience, you . This website will have social medias, gaming, community based organization information and links to all the federal and state resources to benefit you. Your input is needed to make sure it continues in the intended direction as a Peer based website to provide the needs to transition from school, to continuing education, employment, housing and more. Data will be collected on the hottest topics and most "hits" to State, Federal, and County resources as well as community based organizations and 'how to' videos. Please join us in this unique opportunity! Why? To be part of the continued development and input on a Website developed by your PEERS and to maintain meaningful to you and others like you. How? Please click here t o register online! The concept they developed is web based. It provides all resources in one location to support education, employment, transportation, housing and independent living skills. The Civilian Complaint Review Board (CCRB) in conjunction with NYU McSilver Institute for Poverty Policy & Research, and the NYU Law Center on Race, Inequality & the Law is hosting their first-ever youth summit on February 5, 2019 from 9:00 AM - 4:00 PM at New York University Kimmel Center, Rosenthal Pavilion, 60 Washington Square South, New York, NY 10012 . Additionally, the summit will showcase the work of young artists inspired by their experiences with policing. The insights shared by participants from this event will inform CCRB's 2019 report on youth, which will be released later that year. Additional information about the event will be available soon. Please check back here for a schedule of the day. If you have questions about the event, requests regarding accessibility, or need language interpretation assistance, please email outreach@ccrb.nyc.gov. Interpretation services are free upon request. Lift Away the Stigma with MHANYS! Mental health challenges - such as depression, anxiety, psychosis, and substance use - are just as common as physical challenges within the United States. In fact, more than one in five American adults will have a mental health problem in any given year. Yet too often, people do not get the help they need due to stigma. In an effort to galvanize the Capital Region to decrease the stigma surrounding mental health and empower our community to improve their health and well being, the Mental Health Association in New York State, Inc. is teaming up with real [FIT] life to Lift Away the Stigma. Today through October 23rd, 2018, community members will have the opportunity to sign-up to take part in the 2nd Annual "Lift Away the Stigma" Circuit Training Marathon. This event will run from 3pm-9pm with 30-minute circuits sessions beginning at 4 pm at the real [FIT] life studio. "Exercise and fitness are so important to an individual's mental wellness. We thank our friends at real [FIT] life for their leadership role in helping to end the stigma of mental illness," said Glenn Liebman, MHANYS' CEO. Individuals who are interested in sponsoring this event or taking part to help Lift Away the Stigma can do so from now until October 23rd. In order to attend, you MUST REGISTER . Passion Academy - Develop your brand as a rising entrepreneur! Mission Accomplished Transition Services invites you to attend to our mini conference, Passion Academy: Develop Your Brand as a Rising Entrepreneur + Professional. Established entrepreneurs Carmen "Coach Carmen" Duncan and Bob Manasier will coach rising entrepreneurs and young professionals, aged 18-24, through interactive exercises that will help you confirm your professional purpose, goals and discovering the brand that articulates who you are as a rising young professional and/or entrepreneur. The evening will conclude with dinner, nonalcoholic 'No-jitos' and 'Findyamosas' and additional networking with established influential professionals. About Mission Accomplished Transition Services: Our mission is prepare aspiring young professionals for the global economy by providing access to coaching, job training and professional development. We believe everyone should have access to help and support so they can reach their fullest potential. We believe aspiring young professionals have the power to become mature, active, and compassionate global citizens who take responsibility of their future and live a life of purpose.